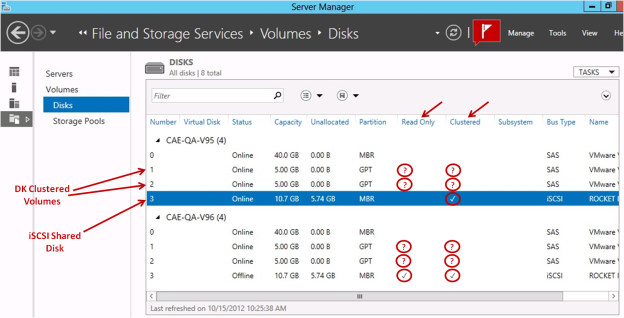 There are some inconsistencies in how cluster disks are shown in the “Disks” display under Server Manager > File and Storage Services > Volumes > Disks. The following screen shot shows an iSCSI Shared Disk and two DataKeeper Volumes in a cluster. There is a check mark under the “Clustered” column heading for the iSCSI Disk, however, the DK Clustered Volumes do not have a check mark even though they are in a cluster. There will be nothing displayed in either the “Read Only” column or the “Clustered” column. This is due to the fact that DataKeeper operates with Volumes, not Disks.